Britain's Prince Harry and Meghan Markle arrive at the Royal Albert Hall in London to attend a concert to celebrate her 92nd birthday on April 21, 2018. Less than a month away from their royal wedding on May 19, Prince Harry and Meghan Markle had a date night on Saturday at Queen Elizabeth's star-studded concert in honor of her 92nd birthday. The high-profile pair donned matching navy ensembles. 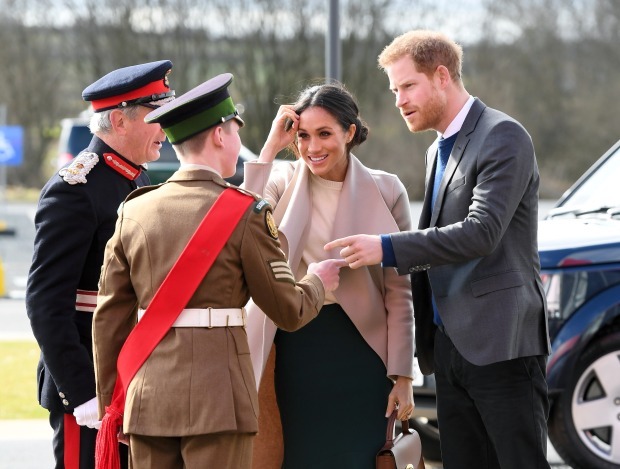 Harry opted for a navy blue suit, while the bride-to-be opted for a navy caped dress by Stella McCartney and matching blue suede heels by Manolo Blahnik and a clutch by Naeem Khan. The pair were photographed arriving at the event, billed as "The Queen's Birthday Party," which was held at Royal Albert Hall in London, England. The Queen, members of the royal family and honored guests attended the celebration. The members of the royal family included son Prince Charles and his wife, Duchess Camilla, as well as grandson Prince Willian. Princess Eugenie, Princess Beatrice, Lady Louise Windsor, Countess Sophie, Princess Anne, Vice Admiral Sir Timothy Laurence and Prince Edward were also in attendance. As Britain's royals prepare to welcome Meghan Markle into the family, there are plenty of customs that must be part of the marriage ceremony. But Prince Harry and Markle have chosen to stray from tradition in some aspects. Here are five ways they are making their big day different. William's wife, Duchess Catherine, who is expecting her third child, did not attend. For the event, Britain's longest-ruling monarch donned a golden ensemble and pearls. The audience was treated to a jam-packed night of celebrity entertainers like Shawn Mendes, Kylie Minogue, Tom Jones, Shaggy, Sting and more.